There are two ways to get from Petra to Amman: the fast way is to take the Desert Highway, a name that leaves little to the imagination, the other is the Kings Highway. The King’s Highway was a major trade route in the ancient Mid-East. It begins in Egypt crosses the Sinai Peninsula then turns north, stretching to Damascus before forking to either Baghdad or Anatolia. 20 Then he said,”You shall not pass through.” So Edom came out against them with many men and with a strong hand. Originally, we were simply going to take the six dollar two hour bus straight to Amman, but we were charmed into taking the Kings Highway route by our driver in Petra. While Jordan is not a big country it is seriously packed with sites of historical significance, and most of those are on or near the Kings Highway. Our Driver offered to take us on a one day whirlwind tour of the Highway, and through a combination of fatigue, vague interest and a sudden aversion to public transportation – we agreed. The first stop was an old Crusader castle – Shobak Castle – in addition to reclaiming Holy sites for Christendom it seems the Crusaders were also interested in controlling this barren hilltop for …well for money. It’s situated at a strategically important site on the Highway. It’s also located near what is thought to be the site of the biblical Las Vegas – Sodom, of Sodom and Gomorrah fame. Our next destination was the Dana Village, a village on the edge of the Wadi Dana Reserve, one of Jordans largest protected natural areas. Um, okay – I didn’t hate it. Next stop – Karak Castle – Karak is kind of the capitol of Southern Jordan. Also a big stop over for Crusaders and pretty much every conquering army over the last few thousand years. 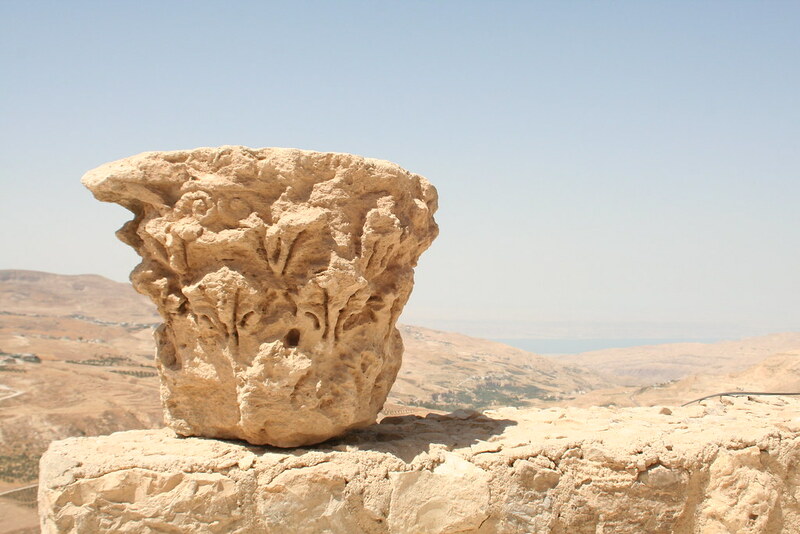 The Castle itself is remarkably well preserved and offers impressive views of the Dead Sea. There is also a sizable Christian community still in town. Next – The Dead Sea. The lowest point on the planet, hot, humid and …hot. Our driver talked us into taking a dip in that nasty water. Normal sea water is 3 to 4 percent salt. The Dead Sea is 30 percent salt. The only thing that lives in it are two types of bacteria – let’s get in it! There are a number of extremely high end resorts on this nasty collection of H2O, I have no idea why. The Dead Sea was quickly followed by – Hammamat Ma’in (Hot Springs). Basically a tea stop for our driver, no comment. The last two stops in our quickly tour was arguably the most important in Jordan – Mount Nebo. This is the site where it is believed that Moses saw the Promised Land of Israel and died. It’s been a pilgrimage site for Jews, Christians and Muslims for oh, a few thousand years. Talk about beating a well worn path! On to Madaba – the home of the ancient tradition of mosaic craftsmanship in Jordan. Also a stopover for Medieval Pilgrims on their way to Mt. Nebo the highlight of this village is an 900 year old map of the Holy Land and Near East. It was recently rediscovered in the floor of a Church during renovations. It was literally hidden right under the feet of worshippers for the last several hundred years. And so eight hours later we arrive in Amman. It was a bit of a breakneck pace, but considering our limited time in Jordan, it was probably worth it.